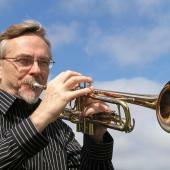 Mark Harvey, Senior Lecturer in Music, Ph.D., Boston University, is a trumpeter, composer, arranger, and founder/music director of the Aardvark Jazz Orchestra. Commissions include those from the Meet the Composer/Lila Wallace-Reader’s Digest Commissioning Program, the Organization of American Kodaly Educators, the 15th Annual John Coltrane Memorial Concert, and the MIT Wind Ensemble. Commissions from the MIT Festival Jazz Ensemble have included compositions written for and premiered by Joe Lovano and Steve Turre. Harvey has appeared with Aardvark and jazz luminaries Geri Allen, Steven Bernstein, Jaki Byard, Jay Clayton, Kenny Dorham, Gil Evans, Jimmy Giuffre, Vinny Golia, Sheila Jordan, Frank London, Howard McGhee, Rajesh Mehta, Claudio Roditi, and Walter Thompson in venues such as Fenway Park, the Berklee Performance Center, the Hatch Shell, the Museum of Fine Arts, the Boston Globe Jazz & Blues Festival, the Rockport Chamber Music Festival, Symphony Hall with the Boston Pops, the Jacob’s Pillow Dance Festival/New Music Series, the Festival of New Trumpet Music [FONT], the Knitting Factory, Village Gate, and Public Theater (all in NYC), the National Gallery of Art, Washington, D.C., the Southern California Institute of Architecture, Santa Monica, CA, the Baja State Theater, Mexico, and the Berlin Jazz Festival, Germany. He may be heard on 30 recordings, including 14 CDs of his original compositions and arrangements with the Aardvark Jazz Orchestra on the Leo, Leo Lab, Nine Winds, and Aardmuse labels as well as albums with George Russell’s Living Time Orchestra [Blue Note] and Baird Hersey’s Year of the Ear [Arista/Novus]. With small ensembles, he has improvised soundtracks for three DVD collections of historic silent films in the Treasures from American Film Archives series. Harvey has received fellowships from the Whiting Foundation and the National Endowment for the Humanities and awards from ASCAP as well as national and regional cultural organizations. He has published essays and lectures widely on jazz and the relationship of music and religion. His 2015 history, The Boston Creative Jazz Scene 1970 -1983, has received widespread critical acclaim. Active for many years with the Boston jazz and arts community, he was honored for this work by the City Councils of both Boston and Cambridge in January, 2013. In 2015, he was named Boston Jazz Hero by the national Jazz Journalists Association. He serves on the board of JazzBoston.